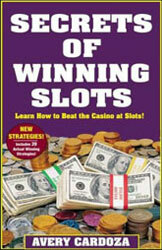 Another book on winning the slot machines is Secrets of Winning Slots by Avery Cardoza. He is one of the skilled folks in the world of gambling. He suggests some aspects the players should pay attention to, and some of them are clearly explained. Avery Cardoza tells to stick with the hot machines. Hot machines are those, which will definitely pay you off. There also can be cold machines that do not pay a penny. Cardoza also covers such strategies like tight and loose machines. He says that loose machines are those, which pay out at least something. The loose machines are located among the tight and average machines. The casinos know what they are doing for attracting the players to their houses. In one of the strategies he offers to play single machines only, but he does not explain why we should choose them. Also he talks about playing the slot machines that hit the jackpots recently and they are worth playing. But it is not a kind or a type of any kind of strategy and that is actually really weird, as it is only a set of recommendations which doesn’t have any statistic prove. We understand that strategy is some kind of set of actions that are combined into an algorithm. But the author simply expresses his thoughts which may be useful at some situations. Cardoza is covering one really important aspect of the professional gaming. He says, if you a serious player, you should write down all your winnings and losses. Mostly losses are important. When you win a large jackpot, you will be able to count your net winning by subtracting all the losses and then you will be able to see whether it was worthy or not. The author gives five essential principles, using which the players can become closer to hitting jackpot. Just like Victor Royer says in his book. You are to be ready to win. The winning attitude is the first and foremost thing the players should have in order to win. The second is playing within your money limit. He calls a smart game the one, where the player does not play over his head. If you cannot afford losing money over some certain amount, you should not continue playing. It is really stupid. Slot Machine Strategy by MacIntyre Symms also says the same. The third is protecting your winning streaks. He also talks about emotional control. If you want to be professional, you are to be really disciplined and cold-blooded. And of course the last point is setting the limit. If you do not develop discipline, you will never win what you want in any game.